Is there a better alternative to Impression for iPhoto? Is Impression for iPhoto really the best app in Image Editing category? Will Impression for iPhoto work good on macOS 10.13.4? Impression for iPhoto... Watermark plugin for iPhoto. Adds high-quality watermarks to your photos. The original files are not altered. 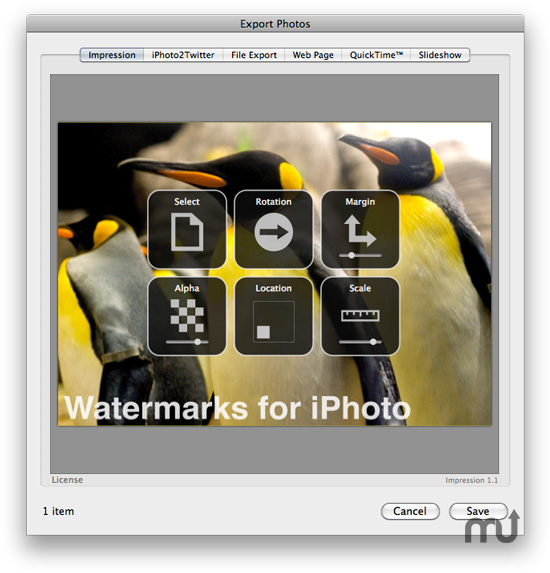 The watermarked photos are automatically imported in iPhoto as copies of the original image. Watermarks can also be created from a RTF text file. The font and color from the file is used for generating the watermark. Mac OS X 10.5 or later, iPhoto ’08 or ’09. Impression for iPhoto needs a review. Be the first to review this app and get the discussion started!